Well, it’s that time of the year again! I can finally stop training inside (where I sweat bucketloads①) and start riding outside for real②. It’s easy to get cabin fever③ in Hokkaido. Although, I guess I’m lucky I don’t live someplace truly cold, like Greenland, Scandinavia, or anyplace north of the arctic circle④. We’re blessed with⑤ some pretty good roads, and eastern Hokkaido usually doesn’t have much car traffic. We’ve also got lots of sunshine, to boot⑥! This year, because of all the snow, my group ride was a little late to start, but we finally had our first outside ride on March 15th. We didn’t run into⑦ any ice, and there was little wind, so conditions were good, if cold⑧….about 0 at the start, but it went up to 7 or so by the end of the ride. If you’ve been to my class, you probably already know that I am a hockey fan. I love hockey. I watch hockey, I play hockey, I talk hockey. To say it simply, I am crazy about hockey. One more thing about hockey before we go any further: the pronunciation. I really don’t know why, but the katakana for “hockey” is ホッケー, but this is definitely not how native English speaking people say it. We say “hockey” as ハーキー — that’s ハー as in “Ha-ha! That’s a funny joke and I’m laughing” and キ as in I’m using a key to open my shed door to get my hockey bag so I can go play hockey. So say it with me now: Hockey, hoc-key, HAA-key. Great job! Anyways, to get back on track, I’m glad I live in Obihiro because hockey is somewhat of a popular sport here. Many people, young and old, play hockey. And quite a few of them are pretty good. Actually, they’re more than pretty good. I think they could hold their own with some of better players back in Canada, and I would not be surprised to see a Japanese person drafted to the NHL in the near future. What’s the NHL you ask? Well that’s the National Hockey League of course. Or, as my Step 3 students will have learned this past year, the NHL stands for (this is certainly one of my favorite phrasal verbs) the National Hockey League. I really like the verbal phrase stand for. I think it’s a wonderful little phrase to use, and it’s a good one to know. Stands for is the same as saying “represents” or “means“. Anytime you can say or use one of these words you could just as easily substitute them for stands for, and doing so would make you sound all the more like a native English speaker. So here is everyone’s homework assignment for today: What does NHK stand for? I’m collecting homework first thing tomorrow morning so make sure you get it done! And that’s all about it from me for this time. In a week from now, the NHL Stanley Cup playoffs will begin. I’ll be sure to check in when things get going and give a detailed description of all the fun that will surely happen. Here are the team logos of all 30 NHL teams. Can you guess which one is my favorite? As a teacher, one of the first questions I ask new students is: “What is your hobby?”. This is a very common question in language lessons all over the world, and there is a reason for it being so widely used. Even though it’s a very short statement, it will usually lead to conversation in the class. This gives the student the chance to talk about something that is very important and personal to themselves. I’ve been teaching English in Japan for over a decade, and I’ve heard some remarkable answers to that simple question. Underwater photography, hunting, women’s sumo, ice sculpture and ballroom dancing come to mind as hobbies that always led to an interesting discussion. I’ve also witnessed long term friendships develop from answering this simple question. Two former students of mine from long ago found that they shared a similar hobby – and that shared hobby led to them getting married 4 years ago. At the same time though, there are answers that are a little confusing. Eating, watching TV and sleeping are some that surprise me. The word “hobby” means two things: first, a hobby is something you do in your free time. Secondly, and more importantly, a hobby is something that you try to learn more about, or get better at as time goes on. If your hobby is eating, perhaps a better way to say it is: “My hobby is trying new recipes.”, unless of course you’re training for a hot-dog eating competition. If it’s watching TV, maybe you could say “My hobby is watching American crime dramas.” If your hobby is sleeping… I’m not sure what you could say. But there’s another problem with the hobby question that’s been bothering me recently. I’ve been finding that I have less and less time to do some of the things that I consider to be hobbies. I often tell my students that one of my hobbies is camping – the problem is that I haven’t had a chance to go camping in over a year. I consider building and modifying guitar effects to be a hobby, but it’s something I haven’t done in nearly three years. If I’m honest, there is a very long list of things that I include in my list of hobbies that I have not actually done in years. Recording music. Mountain climbing. Skiing. Film photography. When should we stop calling something a hobby? What is the time limit? 6 months? Two years? How much time must pass before we delete a hobby from our list? I visited my hometown in Canada on my two-week summer break. I got to enjoy many of the summer delights one can find in Canada. Although I really like summers in Hokkaido, there are a few truly Canadian things that I miss. My favorite thing about summers in Canada might be barbecuing. Canada is cold and snowy for much of the year, so when summer arrives Canadians are very excited to fire up their barbecues. When I was young, my family (well, mostly my Dad) would barbecue 3 or 4 times a week in the summer. Most barbecues in Canada run on gas such as propane, so getting the barbecue started takes little time and practically no effort. Canadian barbecues tend to be bigger too than the ones found in Japan, and they usually have a lid so grilling hamburgers or steak is easy. I’ve attached a picture of my Dad working the BBQ from a couple of weeks ago. He’s making some tasty hamburgers. He doesn’t cook often, but when he does it’s certainly delicious! Another thing I really enjoy in summer in Canada is going to the cottage. A cottage is a simple, second home, usually near a lake as Canada is a country with literally hundreds of thousands of lakes. People go to the cottage to escape the city on weekends, and enjoy fresh air, play games, spend time with their families and friends, and of course drink beer. Not every Canadian has a cottage as they are expensive to buy and maintain, but enough people in Canada do, and I’m thankful that I’m friends with few of them. In fact, I went to my friend’s cottage over the summer. We played some cottage games like horseshoes, went swimming, took a boat ride and had a nice afternoon barbecue. The other thing I love about summers in Canada is camping. I really enjoy camping and I try to go just about whenever I can. There are many great places to camp near and around my hometown, but just a little further down the road there is some truly spectacular canoe camping. A large swath of this area is in Algonquin Provincial Park. 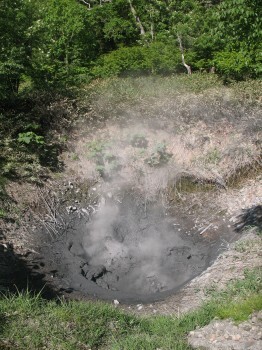 It’s a pretty big park, over 3 times the size of Daisetsuzan National Park, and has a network of very picturesque lakes, small rivers and creeks that you can paddle down and camp from camp site to camp site. The park is really big, so big in fact that you can canoe an entire month in the park and never meet the same river or lake twice. There is also an abundance of wildlife in the park. Beavers, bears, deer, moose, raccoons and other large furry creatures are never too away. I highly recommend going if you visit Canada. All in all, I really enjoyed my vacation in Canada. It was a great trip, and an excellent way to spend a couple of weeks. But I love Hokkaido too, and I’m glad to be back here. Going for a dip! Care to join us? Doesn’t that look good? Yummm! Here’s Dad cooking his burgers! Hello everyone! I’ll be posting to this blog about once a month or so, welcome! 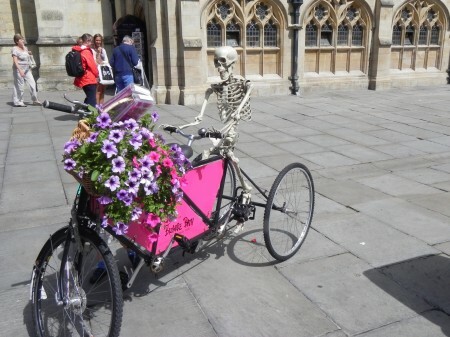 Well, as many of you may already know, when I’m not working at Joy, I’m usually busy training for road racing, as I’m an avid cyclist. I train everyday according to a schedule that my coach prepares for me, and on weekends when I’m not racing, we usually have a group ride on Sunday in place of a race. The group ride is usually pretty hard, as we try to simulate race conditions when possible. That means our ride is a combination of warming up, then sometimes conserving energy by reducing1 wind resistance2 (by riding in another rider’s draft3), and sometimes “attacking” and trying to escape4 from the group or riding very hard up a climb or into the wind. When that happens, we’re training our lactate threshold5, which must be very high in order to do well in a race, so that we don’t get dropped6. Last Sunday we did a recon7 of the Tour De Hokkaido road course. 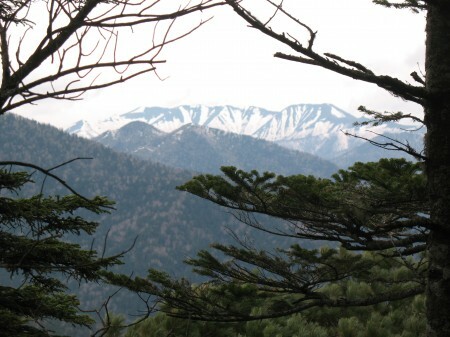 The course starts at Makubetsu Onsen and goes through Furumai, Sarabetsu, Toyokoro, Komahata, Nukanai, and back to Makubetsu Onsen, for a total of about 140 kilometers. The course is very hilly, and it was super hot, but we were able to keep a pretty high average pace, about 35 kph, not bad considering8 there were only a handful9 of us and it was just a training ride. One of the riders with us is still a Junior High student! Anyway, we all survived, although there were a few casualties10 : one rider, T-san, threw up11 (light case of heatstroke12 I think), and I got sunburned, so I now look like a boiled lobster! Hello everyone. How is the weather treating you? I hope you are keeping warm this winter. This past Monday was a holiday, so I decided to do some volunteer work during the long weekend. 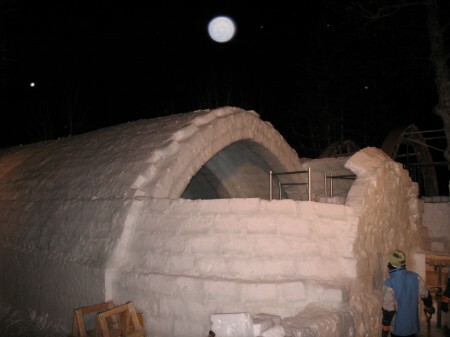 I went to Lake Shikaribetsu to help construct the ice village. Every year for the past thirty years, a group of people have built a village on Lake Shkaribetsu using only snow, water, and ice as building materials. The ice village includes a wide variety of facilities, including a theater, an ice bar, an ice lodge, and even an ice spa. The work was pretty strenuous, and after two days of work, I was thoroughly sore. The hardest part was using a jackhammer to level an ice floor, and dig a trench. I also helped assemble some scaffolding to create a temporary floor, I helped erect some wooden arches that were used as temporary ceiling supports, and I carried a lot of tools, ice, and slush. 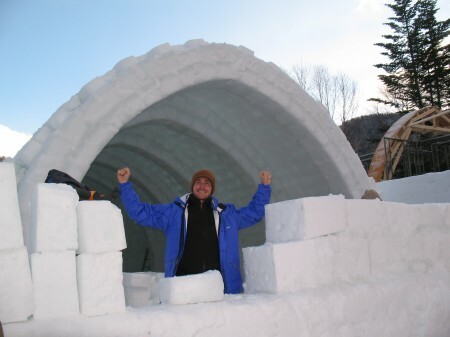 Here’s a picture of me taking a break from laying some ice bricks. From a language learning standpoint, it was great for my Japanese. I learned a lot of words that I probably wouldn’t have learned in a classroom. For example, they were often telling me to carry something from one place to another, so I learned the verb for carry. I think it is good to learn a language in a lot of different environments. The weather was pretty nice for most of the two days I was there. It did snow a little bit but it was light and pretty. Here’s a picture at the end of the second day. The outer wall was almost complete and it was just starting to snow. Yes, that is a snowflake, not the full moon. The ice village is scheduled to be complete and open to the public on January 28th, but if you would like to see it before that you can volunteer. To volunteer, just call the Shikaribetsu Nature Center in at least a day in advance, and let them know you would like to help. Their phone number is 0156 69 8181. Hello everyone! Merry Christmas and a happy new year! This winter vacation Kyle and I went to Hawaii to see our families. 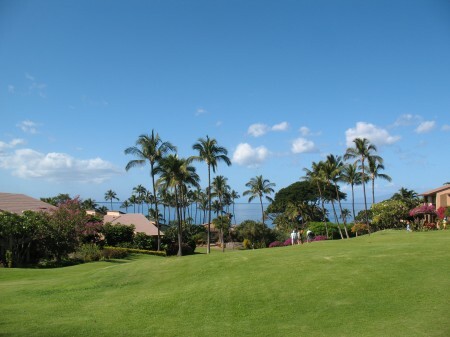 We stayed in a condominium on the island of Maui. The weather was perfect, and we had a lot of fun. We did a lot of exciting things like snorkeling, surfing, and swimming, but the best part of the trip for me was eating, drinking, and relaxing. Here’s a picture of the place we were staying. Our condo was at the top of a grassy hill. It took about 2 minutes to walk down to the beach and 4 minutes to walk back up to the condo. Pretty nice location, don’t you think? During the holidays in the U.S. people eat a lot of food, and I was no exception. At many restaurants in America, the portions are enormous. 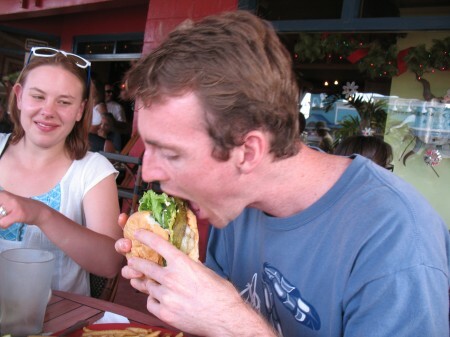 At some places a “normal” meal is two or three times the size of a meal at a restaurant in Japan. Here is a cheeseburger that I’m just about to sink my teeth into. It was so big that I could only just barely take a bite out of it. It had been a really long time since I had gone surfing, so I really wanted to surf while I was there. I missed being out in the waves, getting knocked around, and occasionally riding a wave. Unfortunately, on our side of the island the waves were very small. That being the case, we decided to go stand up paddle boarding. 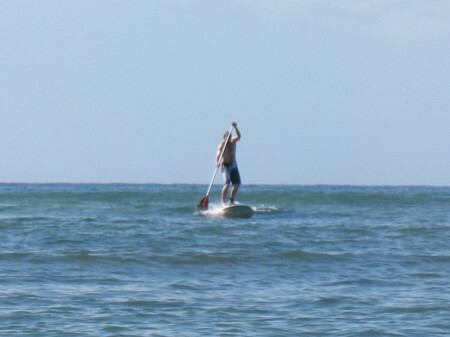 It is similar to surfing, but you have a paddle like in a kayak, and you stand up the whole time. It was pretty fun. I even managed to catch a few ankle high waves. Every night the sunset was so beautiful. Most of my pictures from the trip are of the sunsets. I took so many throughout the course of each sunset. This picture is one of my favorites. 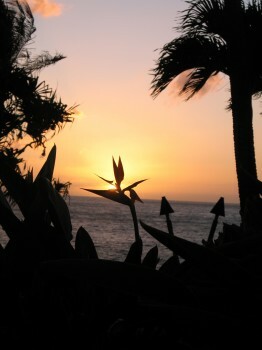 The sun is shining through a Bird of Paradise flower. It is called that because it looks like a tropical bird. To get to Hawaii and back we went a kind of roundabout way. First, we took the bus from Obihiro to Chitose. Then we flew to Seoul, South Korea. From Seoul we flew to Honolulu, and then finally, we flew to Maui. The travel time from our apartment to the condo was about 24 hours. Then when the trip was over, we went back to Japan the same way we came. 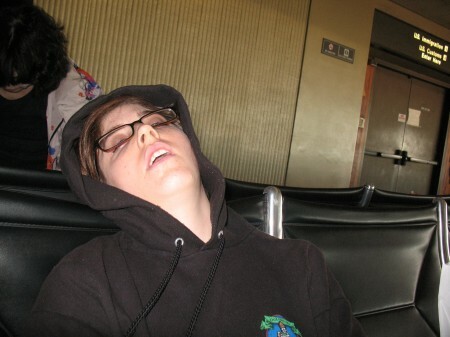 This next picture of Kyle shows how tired we were during our trip home. Over the weekend, I went to the Daisetsu mountains . . . twice! 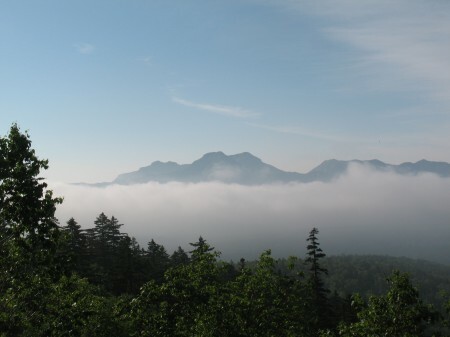 On Saturday I hiked up Red mountain (Akadake) and on Sunday I hiked up Green mountain (Midoridake). It was so beautiful in the mountains. The weather was warm and sunny. It was so sunny that I got a sunburn. Ouch! In the early morning there were some low clouds at the foot of the mountains. Here is a picture of a mountain poking through the clouds. On both mountains there was still a lot of snow. On Red Mountain there were even some skiers. 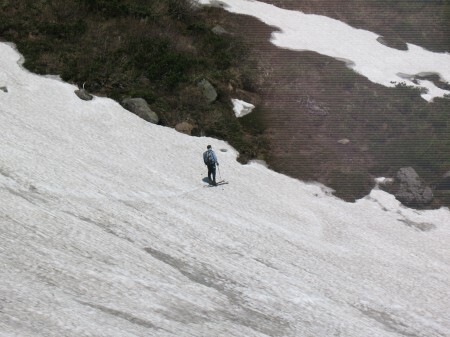 I was very surprised to see people skiing in July. The trail was pretty difficult. It wasn’t too steep or too long, but it was very wet and snowy in some places. 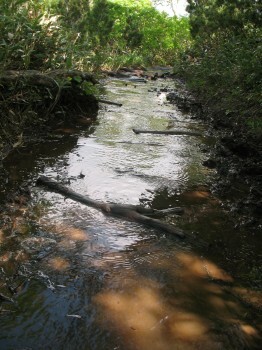 At one point, the trail was completely covered by a muddy creek. Up on the Daisetsu plateau, there is some really interesting wild life. I saw a very unusual lady bug. 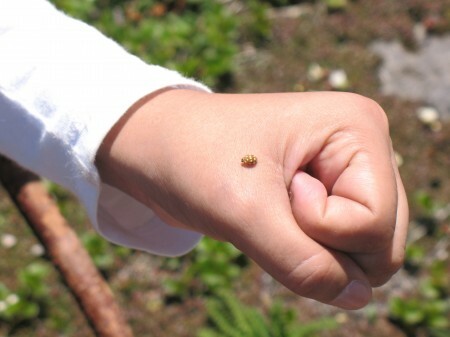 Most lady bugs are red with black spots, but this one was orange with yellow spots. There were some bigger animals too, but we didn’t see them. 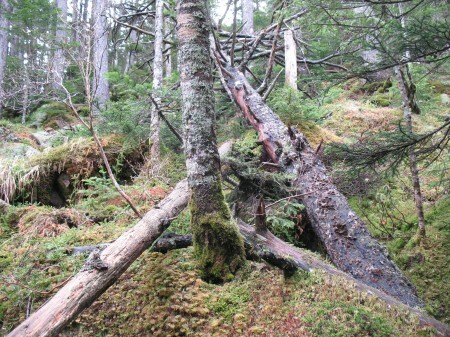 We heard the call of a pika, but it was hiding. It sounded like a pikachu. We also saw a sign that warned us of bears in the area. 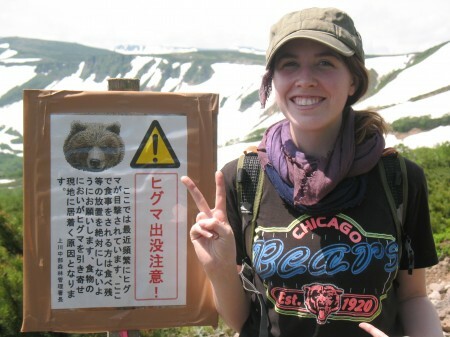 Kyle wore her Chicago Bears shirt to show the bears that we are friendly. In addition to the mountain animals, there was also some amazing plant life. 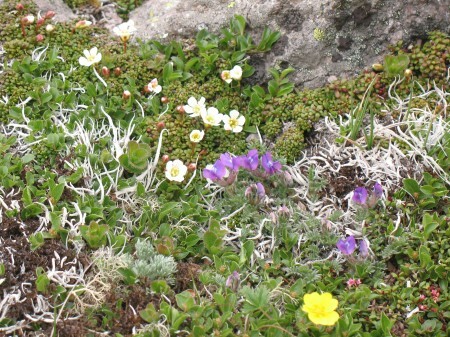 There were many different colors of wild flowers covering the mountainside. Here is an example of some of the flowers we saw. 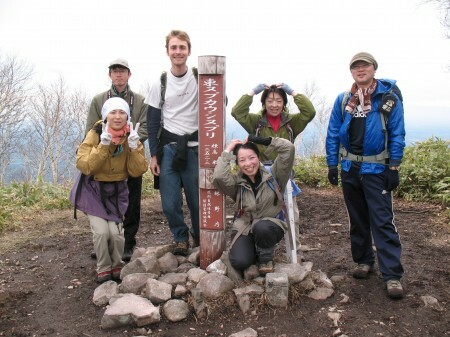 From the summit of both mountains there was a great view of Asahidake. 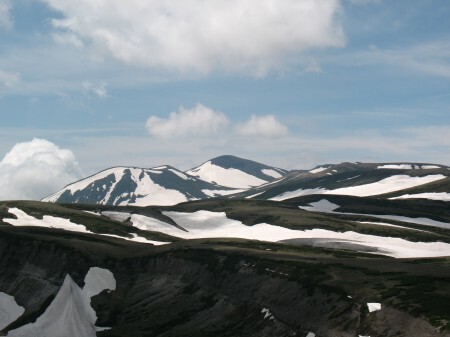 Asahidake is the highest mountain in Hokkaido. It is 2291 meters high. After the hike on both Saturday and Sunday we went to an Onsen. It was my first time to take a hot spring bath. It felt very soothing on my skin, except where I was sunburned! Don’t worry, the bath I went in wasn’t this dirty or this hot! 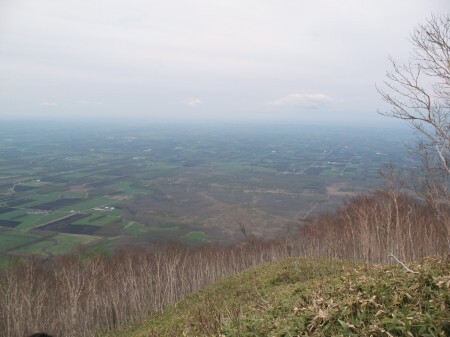 Yesterday I went on my first hike in Hokkaido. It was a lot of fun. I saw many beautiful plants and animals, some of them I had never seen before. The name of the mountain we climbed is Mt. Nupukaushinupuri. It only took us about an hour to get to the top, but the trail was very steep. There were many different kinds of moss. It looked like a giant green carpet covering the forest floor. This moss is so beautiful! 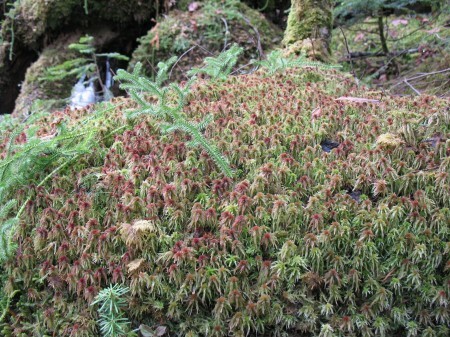 I’ve never seen red moss before. The view from the top was amazing. From one side, we could see more mountains. From the other side, we could see the patchwork pattern of some Tokachi farms. Here is a picture of our group at the summit. Do you like hiking? Where is your favorite place to go hiking? Spring is an exciting time for gardeners. 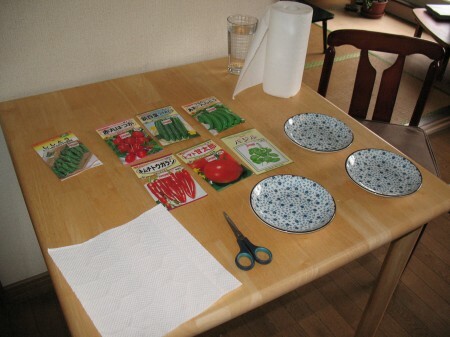 It is time to plant flowers and vegetables. Every year I try to make a garden. This year I will be gardening in my apartment, and we don’t have a lot of space. We have a window and a balcony that get good sun light. I will grow tomatoes, basil, peppers, cucumbers, radishes,potatoes, and spinach. Is that too many plants? I hope they all fit in the apartment. 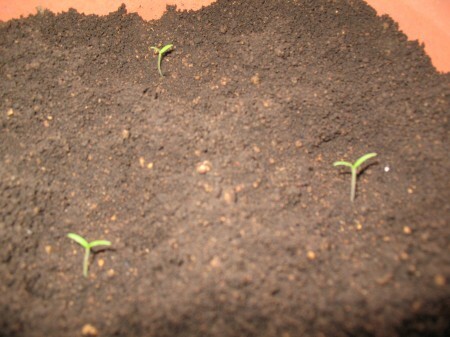 Here is a picture of my cherry tomato sprouts: If you want to learn how to start plants from seeds, it is easy. You can use a plate and a paper towel. First, cut the paper towel in half. Then, fold the paper towel in half, and put it on the plate. 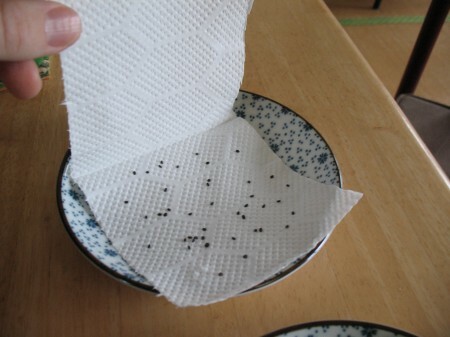 Next, put some seeds on the paper towel. After that, put a little water on the paper towel. The whole paper towel should be wet, but not too wet. You can tilt the plate until the water stops dripping, then it is perfect. Finally, put a plastic bag around the plate so it doesn’t dry up. In 1 or 2 weeks you will have seedlings! Happy gardening! hirona@joyworld.com/When is a hobby not a hobby? Copyright © 2010-2019 JOY ENGLISH ACADEMY. All Rights Reserved.